Tampa, FL —Tuesday, January 24, 2017— Leader Tech announces the introduction and immediate availability of a complete line of TGF thermal gap filler sheets. The initial product launch includes 13 different formulations that deliver thermal conductivities ranging from 1 to 6 W/m∙K. 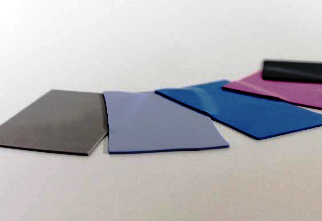 These low cost thermal gap fillers are available in thicknesses from 0.20 mm to 13.0 mm and can be ordered in a wide variety of both standard and custom profiles and sizes. Most of the common thicknesses are available from inventory, all others have short lead times. When sandwiched between a heat sink and a heat source, such as a microprocessor or power converter, Leader Tech TGF materials conform to surface irregularities and help eliminate performance‐killing air gaps. The resulting increase in surface contact with the heat source dramatically improves the cooling effectiveness of the heatsink. Leader Tech is a world‐leading innovator and manufacturer of EMI shielding products for circuit boards, electronic enclosures and interconnect cables. The company's core product offerings include standard and custom circuit board shields, beryllium copper fingerstock gaskets, conductive elastomers, advanced RF absorber materials and EMI/RFI ferrites. Leader Tech is a wholly owned subsidiary of HEICO Corporation, a successful and growing technology‐driven aerospace, defense and electronics company. HEICO Corporation is a New York Stock Exchange listed company (NYSE: HEI and HEI.A) and has been ranked as one of the 200 "Best Small Companies" and 200 "Hot Shot Stocks" by Forbes. For more information, call (813) 855‐6921 or visit us on the Web at http://www.leadertechinc.com.